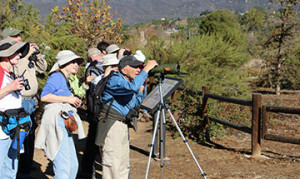 The Ojai Meadows Preserve is a flat, two mile trail along a restoration area, riparian wetland, and a pond. Since restoration work began in 2005, over a hundred species of birds have returned to the area. The pond was dry before the recent rains, but if it has water expect ducks, shore and marsh birds. Birds recently seen include, a nesting pair of Red-tailed Hawks, White-breasted Nuthatch, Say’s Phoebe, Cassin’s Kingbird, American Kestrel, Western Bluebird, Acorn Woodpecker, Northern Flicker and Hermit Thrush. There should also be some lovely wildflowers in bloom. FILM – From Billions to None: The Passenger Pigeon’s Flight to Extinction reveals the compelling story of the unlikely extinction of the passenger pigeon and explores the pigeon’s striking relevance to conservation issues today, such as the alarming depletion of shark species worldwide. For centuries, the sleek, long distance flyer was the most abundant bird in North America, and perhaps the world. It was hunted to extinction in a matter of decades. On September 1, 1914, Martha, the last passenger pigeon in captivity, died in the Cincinnati Zoo, marking the end of the species. Please wear sturdy shoes, bring water and sun protection. Reservations are requested. For more information or to make a reservation contact Marti Reid at (805) 649-6852 ext. 2 or marti@ovlc.org.